You can find the PopMatters review here and the New York Journal of Books review here . 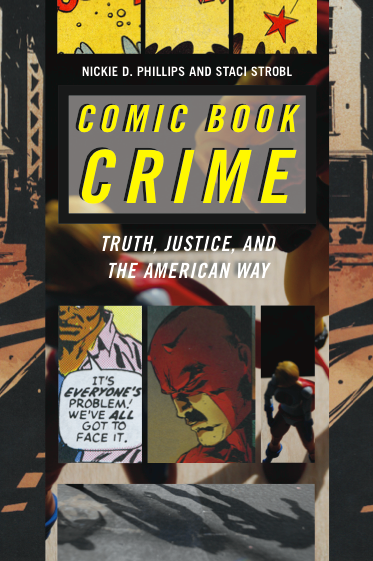 Our book “Comic Book Crime: Truth, Justice, and the American Way,” published by NYU Press, is now available. Read our post in the Wall Street Journaldiscussing the concept of deathworthiness and Superman's actions in Man of Steel (beware: spoiler alert! ).Our book “Comic Book Crime: Truth, Justice, and the American Way,” published by NYU Press, is now available. Graphic Justice: a one-day symposium on the intersection of comics and graphic fiction with the concerns of law and justice, to be held at St Mary’s University College, London on 11 September 2013. With Anglophone comics, Francophone bandes dessinées, and Japanese manga, graphic fiction represents an expanding dimension of today’s global popular culture and is a richly innovative form of expression. From the overt law and order focus of many mainstream superhero narratives and comics-inspired blockbuster movies, to the more nuanced examinations of the human condition in less mainstream graphic works; from copyright to the freedom of expression; from the blurring of text and image in the very medium itself to representations of law, justice, and legal systems on the surface of its pages: comics and graphic fiction are rife with themes relevant to law and justice. Comics have been receiving an increased level of academic attention in recent years, with dedicated journals and conferences springing up around the world. Yet the significance of comics with respect to the concerns of law and justice has received little critical attention. As a development of existing disciplinary fields such as law and popular culture, law and literature, and legal aesthetics, graphic justice is a research alliance aimed at increasing engagement with this under-explored disciplinary crossover. 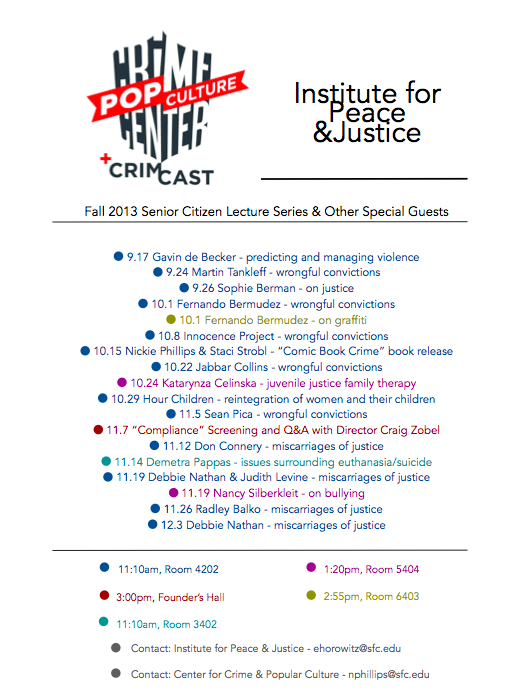 The draft program for the Graphic Justice Symposium can be found here. The symposium will be held September 11, 2013 at St Mary’s University College in London. CrimCast welcomes Carol Tilley, assistant professor at the Graduate School of Library and Information Science at the University of Illinois. Professor Tilley recently published "Seducing the Innocent: Fredric Wertham and the Falsifications that Helped Condemn Comics" in Information & Culture: A Journal of History.You are one of the few scholars who have gained access to Frederic Wertham's papers and other personal archives, now housed at the Library of Congress. Can you tell us what prompted your interest in the project and how were you able to gain access to this vast amount of information? For the past eight years or so, I’ve been studying how librarians and other reading guidance professionals responded to comics captivating influence on young readers during the 1940s and 1950s. Even though Wertham was not the primary focus of my work, he is someone difficult to ignore when thinking about comics during these years. Anti-comics sentiment preceded Wertham’s interest in the topic by nearly a decade, but for the last few years of the 1940s and throughout the 1950s, he was the figurehead for the movement that sought to restrict the sale of comics to America’s youth. Wertham was something of a packrat too, as there are more than two hundred boxes of his materials preserved at the Library of Congress (LOC). Although not all of these materials are related to his work on comics, many of them are. I was curious to learn about his correspondence with librarians, teachers, parents, and other folks who were interested in children’s reading and welfare. So, my initial reason for using the materials had little to do with Seduction of the Innocent (Rinehart, 1954), the book about comics for which Wertham is popularly and infamously remembered. Although Wertham died in 1981 and his materials were transferred to the LOC soon afterwards, his papers have been open for research use since mid-2010. Before that time Wertham’s literary executor controlled access to those materials. Barty Beaty, professor of English at the University of Calgary, was the only person granted significant access to the materials. His book Fredric Wertham and the Critique of Mass Culture (U of Mississippi Press, 2005) makes use of the collection. James Gilbert, professor of History at the University of Maryland, also made use of Wertham’s papers for his book A Cycle of Outrage: America’s Reaction to the Juvenile Delinquent in the 1950s (Oxford, 1988). Gilbert had access to these materials while Wertham was still alive. You mentioned in the article that many scholars were long suspicious about Wertham's methodology. What was your most surprising finding? Your treatment of contrary evidence and, in fact, anyone who disagrees seems to me to be as unscientific as you demonstrate the defenders of the comic book have been. [April 16, 1954, Box 123, Folder 7, Wertham papers]. The comics creator and scholar Stephen Bissette more recently took issue with Wertham’s method and presentation. In Teen Angels & New Mutants: Rick Veitch’s Bratpack and the Art, Karma, and Commerce of Killing Sidekicks (Black Coat Press, 2011), Bissette points to Wertham’s “circularity of logic” (p. 67) along with the absence of context, “methods, footnotes, or attribution” (p. 68). Despite these and other critiques, I was astounded to discover numerous instances where Wertham seemed to disregard an even more basic idea about presenting evidence—that you don’t ‘doctor’ it. Here’s a fairly typical example. "Patient says she reads love comics, 'if I have any.' 'I buy one once in a while, but mostly I trade them.' Titles: True Story, Superman or something like that; sometimes I see Crime Does Not Pay; Love For Two, Romance, that is all. The story where somebody steals is in Crime Does Not Pay. In the Love Comics they sometimes steal...My mother says she does not want me to read comic books because they interfere with my school work and she just don't want me to read them." In other examples, Wertham turned a single teenage boy into several different people, borrowed phrases and ideas from colleagues and acquaintances, and exaggerated or distorted evidence. For instance, Wertham recounted the experiences of one boy: “‘I read the comic books to learn how you can get money. I read about thirty a week. I read Crime Does Not Pay, Crime and Punishment, Penalty, Wanted. That is all I can think of” (p. 73). Yet, in the original case notes [Box 109, Folder 16], the boy told Wertham he read only five comics a week. You state that Wertham "manipulated, overstated, compromised, and fabricated evidence" to support his contention that comic books contributed to maladjustment and deviant behavior among children. Further, you describe Wertham's conclusions as being driven by a rhetorical strategy to bolster support for his position. Yet, you acknowledge in the article that you are ultimately conflicted about Wertham. Can you tell us more about that? Your article has received quite a bit of media attention. Were you surprised that your work would receive so much attention from the mainstream press? Can you tell us about any projects that you are currently working on? Should we look forward to more research from the Wertham archives from you? Eventually you’ll see more from me that draws on the Wertham archives. I’ve got a chapter out soon on the use of comics in language arts classrooms during the 1940s and 1950s, a paper on early (1930s and 1940s) reading promotion efforts in National / DC comics, and a chapter forthcoming on how young comics readers responded to comics’ critics such as Wertham. My bigger ongoing project is writing a history of young people’s readership of comics from the 1930s through the 1950s. If you’re interested, you can keep up with my comics research via my webpage or via Twitter (@CarolGSLIS). This is the second of our 5-part series appearing throughout 2013 focusing on the often game-changing discoveries that come out of archival work in the realm of police, courts, and corrections. 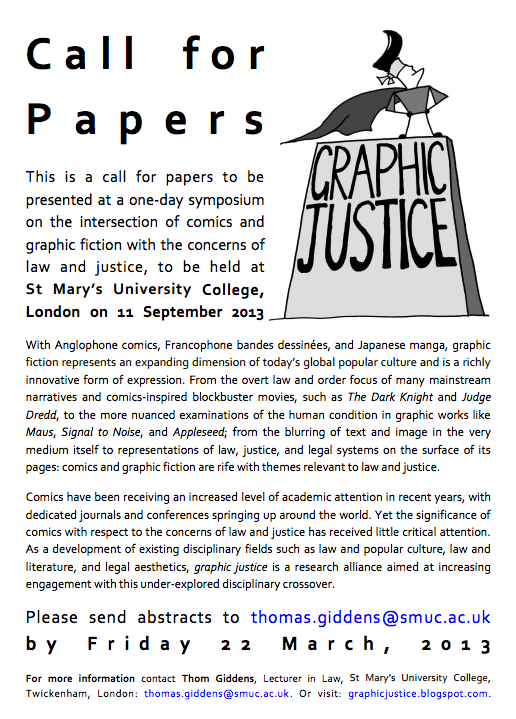 Thomas Giddens is hosting the Graphic Justice Symposium on September 11, 2013 at St. Mary's University College, London. Please go here for more information. Garth Ennis once again tackles the theme of vigilante justice in his new comic Red Team. For those interested in themes of justice and retribution in popular culture, the comic promises a rich study. Ennis' (along with artist Craig Cermak) Red Team hits the stands the same week that Christopher Dorner is on the run from law enforcement. Dorner, rogue cop and alleged murderer, turned his anger on members of the LAPD and their families which he accused of being corrupt. Dorner's motivation is outlined in his manifesto in which he alleges corruption within the LAPD. He is believed to have killed four people, including the daughter of a police captain and her fiance, and injured others. The manhunt for Dorner has ended, and after a shootout with authorities, he is now believed dead in a burned-out mountain cabin. There is certainly a cultural appetite for vigilante justice, as evidenced by those who voice support for Dorner. Many have likened Dorner to Rambo and other fictional vigilantes who fight the system. It is through these popular culture narratives that we collectively process our anxieties about crime, justice, retribution, and vengeance. As such, Dorner "means" different things to different people. Chauncy DeVega, writing for alternet.org, suggests that Dorner may serve as a "symbol that speaks to our collective subconscious" and part of our "American cultural mythos." "The starting point for 'Red Team' was, essentially, what if someone tried to be the Punisher for real?" Ennis continued. For more on Dorner and the Starkweather Syndrome, go here. 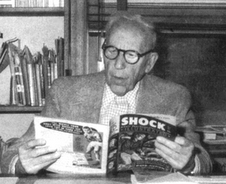 Frederic Wertham is most known for his scathing attacks on comic books, suggesting that they influence deviant behavior and juvenile delinquency. In 1954 he published Seduction of the Innocent which contributed to public and political debates about the relationship between comic books and behavior, and was a contributing factor to the decline of the comic book industry. In 1954, Wertham testified at the Senate Subcommittee Hearings into Juvenile Delinquency arguing the deleterious effects of comic book consumption by youth. For more on Wertham, see Bart Beaty's Frederic Wertham and the Critique of Mass Culture. Her article titled Seducing the Innocent: Fredric Wertham and the Falsifications that Helped Condemn Comics can be found in Information and Culture: A Journal of History. Psychiatrist Fredric Wertham and his 1954 book Seduction of the Innocent serve as historical and cultural touchstones of the anti-comics movement in the United States during the 1940s and 1950s. Although there have been persistent concerns about the clinical evidence Wertham used as the basis for Seduction, his sources were made widely available only in 2010. This paper documents specific examples of how Wertham manipulated, overstated, compromised, and fabricated evidence—especially that evidence he attributed to personal clinical research with young people—for rhetorical gain. The most recent issue, "The Activity" #7, had the participation of Navy SEALs, who co-plotted a major scene in the story.